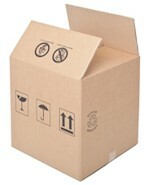 Box Works offers same day delivery of Packing and Storage boxes to Liverpool home movers. We supply packing and storage boxes, boxes with lids and carry-handles, wardrobe boxes, crockery and glassware packing boxes, discounted home moving packs, bubble wrap, tape, mattress bags, furniture covers, vacuum bags, corrugated paper, stretch wrap, removal blankets, packing paper and polystyrene chips. All our packaging materials are trade standard, exactly as those used major removal and shipping companies. Our combination of quality, service and value is without equal for the following reasons. Because our products are large and bulky they cost a great deal to ship over distance. We therefore supply only within our own locality. This decision is helping us to deliver exceptional value to local home movers. We use our own vehicles to deliver at a time agreed with the customer. In so doing we keep complete control of our products and service. All our boxes are strong double wall and all are printed with fragile and handle with care symbols. With every twelve boxes, our customers receive a free roll of high quality strong bond tape, thus ensuring that customers achieve a strong tamper evident seal. We do not compromise on quality. All our boxes are manufactured from seventy five per cent recycled papers. However, every box has a strong moisture resistant kraft paper on its outer face, thus ensuring that the box maintains its strength and durability. Our products are delivered at an agreed time. To ensure arrangements can be made orders must be placed over the phone. – Call today and order professional movers packaging materials. We have never knowingly had a dissatisfied customer. However, if you are not completely satisfied, we offer a money back guarantee. Please see our terms and conditions.